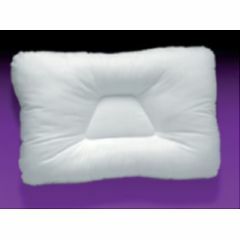 Trapezoid-Center Pillows provide correct neck support to back and side-lying sleepers. Filled with high-quality DuPont™ Dracon Hollofil II fiber-dense and resilient. Blended fiber is blown into the pillows for smooth, even contours and long life. Maximum loft and support. After an injury on the back of my head, my down pillows became too hard. I purchased this one hoping that it would give me relief due to its configuration. However it also is too hard. I have now ordered the smaller gentle version with hopes of more ease. I'll report on it when received. I also purchased the hospital quality eggcrate mattress topper and it has given me relief.